Chrysmela earring backs lock earrings—like investment pieces and sentimental favorites—in place so you can wear them worry-free. Nine precision-machined parts, including three micro ball bearings built into the back auto-adjust to an earring post to hold it firmly in place and can grab the notch in the post for extra security. Made with platinum- or gold-coated surgical stainless steel to be both long-lasting and to blend in with those extra-special earrings. Gain extra support with these backs that have a lift disc so earrings look ideal and are held up perfectly in place. Now your earrings can stay secure and lifted, until you unlock them. 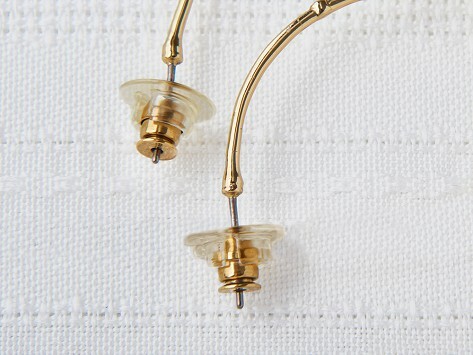 These are the most secure and easiest to use earring backs I have ever had. Worth every penny. love the safety of this! just love these. Protect your earrings and your worries and put these on to protect you. So easy then forget about it.